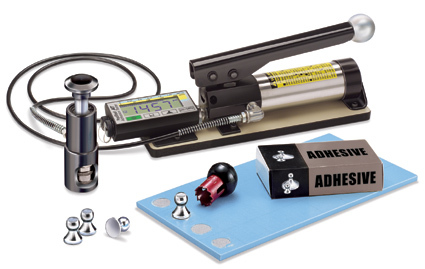 The availability of a full range of pull off adhesion tester models facilitates the measurement of coating adhesion on almost any rigid substrate. For example, 20 mm dollies may be ideal for typical coating bond strengths on metal, plastic and wood, where as 50 mm dollies are more ideal for coatings on masonry substrates such as concrete. Many manufacturers also offer custom dolly sizes to address special measurement needs. For example, decreasing the dolly size from 20 mm to 10 mm, increases the pull off range of the gage by 4 times, allowing some manufacturers to accurately measure bond strengths over 12,000 psi. Keeping the dollies inexpensive eliminates the need for reusing dollies, greatly simplifying the preparation process, with an additional benefit of allowing physical samples to be maintained for future reference or evidence of pull off test results.